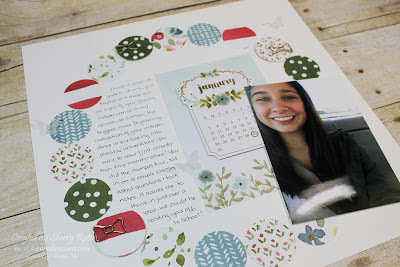 If you are a regular reader, you know that I LOVE Stampin' Up! 's Paper Pumpkin monthly kits. Decembers kit was no exception. It was this fabulous 4x6 desk calendar. Which is great but what do you do with the cards when the month is done? You don't want to throw them out! I love that they are 4x6 so they can easily be added to Project Life or include them on a layout! For this layout I circled a day in January that indicated a huge sign of independence for our daughter, added a photo and then did some journaling about the emotions behind it. I love the simplicity of the layout! It really showcases the photo and the story. Tip: to create the circle, I lightly traced a dinner plate on the cardstock. This allowed me to easily position the 1-1/2" punched circles so that they lined up to create a nice shaped circle. I love using Paper Pumpkin in my memory keeping. 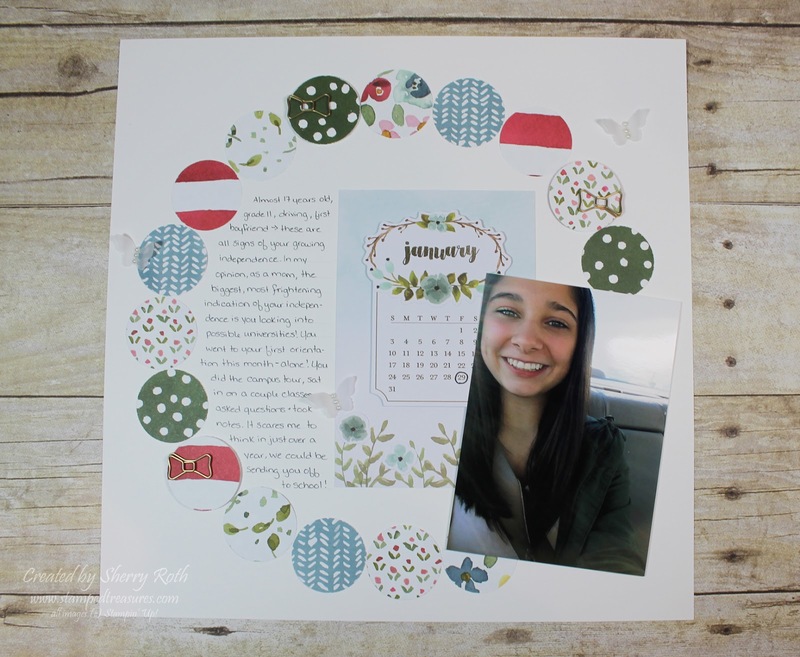 Many of the kits are themed for upcoming occasions/holidays which makes the stamps and accessories easy to incorporate into your layouts! Sign up for Paper Pumpkin during Sale-a-Bration (until March 31st) and you can save on the 3-month subscription AND qualify for a free SAB item! If you are Canadian purchase your 3-month subscription from my online store (#137859) and then set up your profile here!